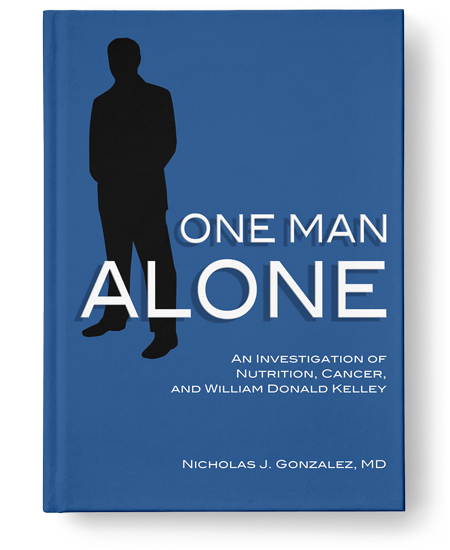 In this monograph, Dr. Gonzalez describes his investigation of the nutritional/enzyme cancer treatment developed by the alternative practitioner Dr. William Donald Kelley. In addition to a discussion of Kelley’s treatment approach, the book includes 50 case histories of successfully treated cancer patients. Although first completed in 1986, this monograph was not published until 2010, rewritten and with an updated introduction by Dr. Gonzalez. The book is now available to all those with an interest in cancer in general, the enzyme treatment of cancer in particular, alternative medicine, and Dr. Kelley. The Introduction, the Table of Contents, and Reviews can be viewed on the New Spring Press site, along with a sample case report of a remarkable patient whose advanced prostate cancer regressed under Kelley’s care. “I especially enjoyed Dr. Gonzalez’ presentation of Dr. Kelley’s case history data. I think the argument relating to the rarity of spontaneous remission dramatizes the power of the results. The case histories themselves are very dramatic, leaving no doubt to anyone with a reasonable mind, of the efficacy of Dr. Kelley’s program.”; Stephen Levine, Ph.D. reviewing the book on Amazon.